View the new AR-ONE 17TH Toy Hauler Travel Trailer for sale. This model not quite your style? 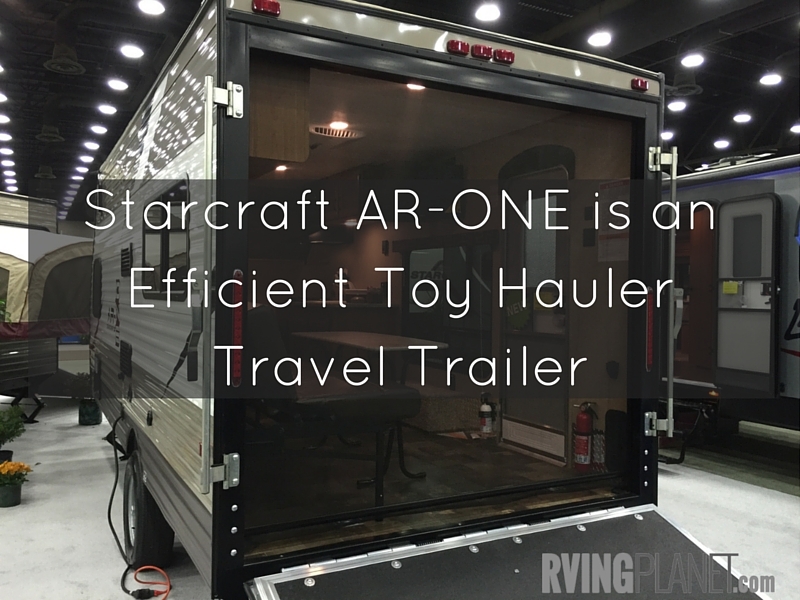 View all other Starcraft AR-ONE Toy Hauler Travel Trailer floorplan styles. Nate: Hi again, Nate from RVing Planet, and I have Steve Schumacher here with Starcraft RV. He is here to show us this new toy hauler. Steve: Thanks, Nate. Yes Nate, we got some cool new features on this 17TH toy hauler from Starcraft. Couple nice things, there’s a large ramp in the back with storage for a nice, full sized quad, a screen room inside on the outside, and also, a TV inside. Some pretty cool features for a little, small 17 foot toy hauler. Nate: Yes, Steve, those are some pretty cool features. If you guys want to learn more, you can check out the video notes below, or you can head over to the new section of rvingplanet.com.